Rent My Vacation Home report on lodging at the Arnold Palmer Invitational in Orlando Florida. The company is having a Free 30 day nationwide trial because of a vacation home shortage due to this event. Rent My Vacation Home dot com report on lodging at the Arnold Palmer Invitational in Orlando Florida. The company is having a free 30 day trial because of a vacation home shortage due to this event. One of the crown jewels of the PGA Tour, the event annually attracts one of the strongest international fields of the season. Past Arnold Palmer Invitational champions who regularly play in the tournament include Fred Couples, Phil Mickelson, Ernie Els, Tim Herron and Tiger Woods. Proceeds from the Arnold Palmer Invitational benefit the Arnold Palmer Hospital for Children and Winnie Palmer Hospital for Women & Babies.Rent My Vacation Home is out of homes for this event and is now offering a free trial of 30 days for homeowners. The event is on Saturday / Sunday Golf Channel: 12:30 p.m. to 2:30 p.m. ET and NBC: 2:30 p.m. to 6:00 p.m. ET.Vacationers have reported earning over 10,000 per week per house. : What time does play start? Exact start times will be available early tournament week.Estimated start times are as follows:Saturday/Sunday 9:00 am. All start times are subject to change as determined by the tour. 1st Mo. Free Americas Largest Vacation Home Network®, 83 Sites! 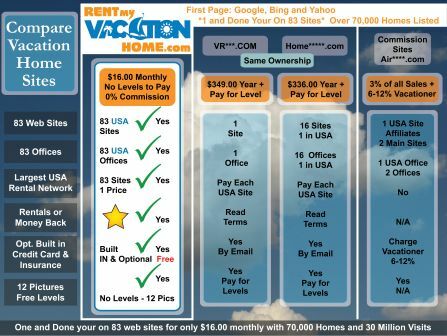 30 Million People visit the Rent My Vacation Home® Network every year, 83 Offices & 83 Web sites all in the U.S.A.
•Inquiry form on 83 sites & 12 Xtra Large Pictures Included. •List your Home For Sale and/or Rent. •Post links from 83 sites to your site and You Tube Videos.